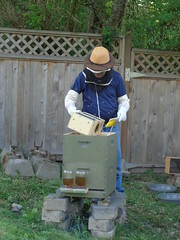 Back several months ago, perhaps as early as January or February, my wife suggested I consider taking a beekeeping class. Both of us have been mildly interested in bees for a while, and I love honey on or in just about everything (as do my children), so it seemed like a good idea. 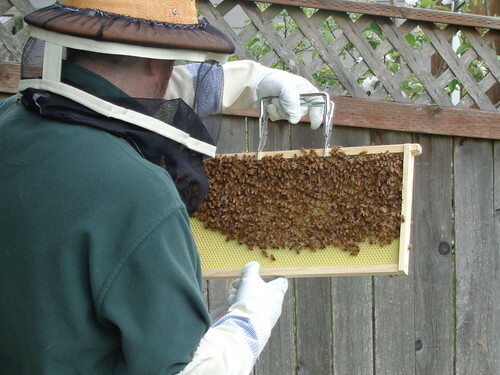 For about a month and a half, every Tuesday evening I drove up to Silverdale to attend a beginning beekeeping class. I bought equipment sufficient for two hives, figuring that since I didn’t know what I was doing per se, having two hives would give me two data points so I’d be slightly less driving blind. 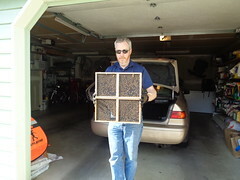 Then on one particularly sunny Saturday in April, my pre-ordered two packages of bees arrived. According to the experts, there were about 10,000 bees in each package. Each package is a small, thin wooden box with screens on the long sides for ventilation. Inside are the bees, plus a canister of food (sugar water), and a tiny box housing a single queen. The queen is in this tiny box to separate her from the worker bees. The queen is usually not from the same hive as the workers, so the tiny box protects the queen until the workers get comfortable with her. 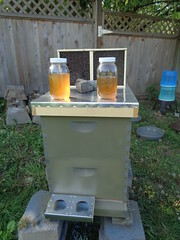 Prior to picking up the packages, I had setup the hives themselves in our backyard and painted them. To begin with, I setup a bottom brood super (the bottom square box) with 10 frames inside, and an empty brood super box on top. That way, when I dumped the bees into each hive, they’d have plenty of room to be able to work their way down into the frames of the hive without getting squished. Earlier that day, Sharalyn had made up a batch of what we’ve been calling “fake bee puke,” which is just sugar water made from natural, unprocessed sugar. (Honey is basically bee puke. And the sugar water is to help feed the bees while they get established in the hive.) The fake bee puke gets placed in large mason jars with tiny holes in the lids. 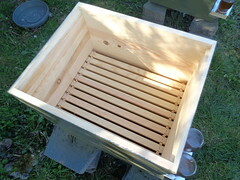 These are turned upside down and put into feeder holders that slot into the opening of the hive at the bottom. 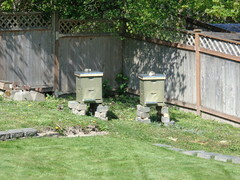 With all that done, it was time to install the bees. We kept feeding the bees for a couple of weeks, putting out refilled jars of fake bee puke when levels got low. Mostly, we just tried to ignore the bees and let them do their thing. There wasn’t much activity for the longest while, but we did see them leaving the hive and buzzing around a little. 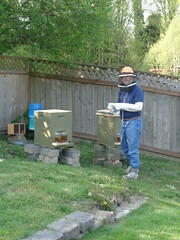 After two weeks, it was time to open up the hives and inspect how the bees were coming along. The bees were indeed busy and were building all sorts of comb out. It was exciting to see those little ladies working so hard. 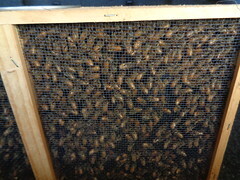 After many months of slow growth, we’ve added frames to the upper brood super and even our first honey super. Basically, you grow the space the bees have in the hive as they start to fill up the space they have. At this point, we have two very strong hives both with two brood supers and a single honey super on top. 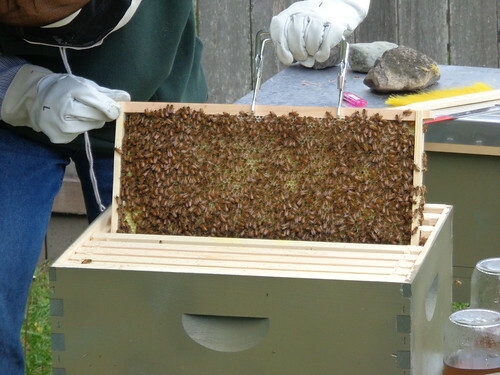 We may add a second (and final) honey super on top depending on how much they build over the next few weeks. Generally speaking, honey bees are quite friendly. Or at least, they remain more or less indifferent to anybody or anything. They buzz around doing their thing, and unless you really go out of your way to annoy them, they just ignore you. They’re almost like the Borg that way, I suppose. All content, programs, graphics, styles, and other resources of this site, unless otherwise noted, are provided as-is and may or may not represent the opinions of J. Gryphon Shafer or any other person or persons who may or may not contribute to, read, ignore, or other exist with regard to this web site. Use at your own risk.